Land Destroyer: Reuters Accidentally Exposes Thai Regime's "Supporters"
Reuters Accidentally Exposes Thai Regime's "Supporters"
Western media exposes Thai regime's "supporters" as manipulated enclave of impoverished, uneducated rice farmers occupying Khmer Rouge-style "red villages" who want anti-regime protesters "dead." November 30, 2013 (Tony Cartalucci) - Reuters, in perhaps an attempt to prop up the crumbling Wall Street-backed regime in Bangkok, Thailand, has attempted to portray it as a popular, "democratically elected" government. What its article, "Thailand's red-shirt heartland hides its strength," ends up doing instead, is exposing the regime's support base as a pitiful, forsaken segment of Thai society, manipulated and exploited for now over a decade to build up an unassailable voting block and violent personality cult upon which the Thaksin Shinawatra regime stands. Reuters intentionally downplays the numbers and constitution of the masses swelling in the streets of Bangkok, andnow in provinces across the country, including in the rural areas once thought to be exclusively behind the Shinawatra regime. Image: Real protesters. 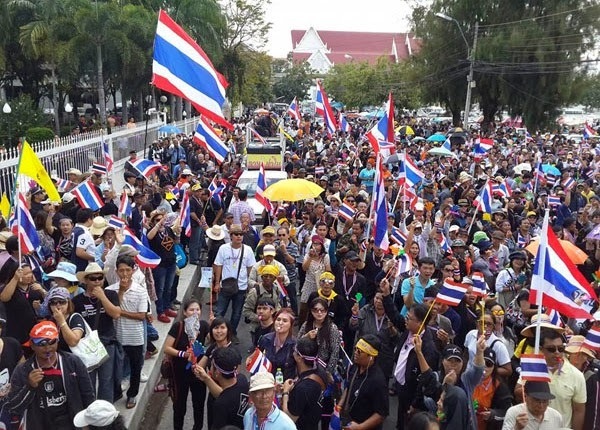 About 1,500 anti-regime protesters gather in front of the provincial hall in Nakhon Ratchasima (Korat) on Thursday afternoon. (Photo by Prasit Tangprasert) Korat is considered the "gateway" to Issan, the northeastern region once considered the exclusive domain of the Shinawatra regime. Locals are now breaking down the barriers of fear after years of violence and intimidation used to keep the silent majority silent. It also attempts to explain why, thus far, counter rallies organized by the Shinawatra regime, have been dwarfed by anti-regime protests. Hua Khua is one thousands of communities that movement leaders call "Red Shirt Villages". These days, this means little more than one tattered office bearing Thaksin's image. But support here for the government runs high. Love for Thaksin stems from pro-poor policies during his time in power, including easy credit and near-free healthcare. More recently, his sister's government has maintained support with a rice subsidy scheme, which has been derided by the opposition. The economy in the northeast grew 40 percent between 2007 and 2011, nearly twice the national average. There are some signs support may have slipped a little. A survey by the Isaan Poll Project, run out of the city of Khon Kaen, found Puea Thai's support in the northeast dropped from 80 percent after her 2011 election to about 64 percent in the third quarter of this year. Of course, between 2007-2011, the Shinawatra regime was not actually in office, but their main opposition, the Democrats were. Yingluck Shinawatra came to power in 2011, and since then, the economy has faltered, particualry because of unsustainable, vote-buying populist schemes. The Bangkok Post reported that the losses for the 2011/2012 season were estimated at around 140 billion baht and a staggering 210 billion baht for the 2012/2013 season. One can only guess as to why Reuters is intentionally misleading readers. Perhaps, just like TIME magazine recently did, it is accepting money from Thaksin Shinawatra's vast army of Washington lobbyists to write stories in support of his dictatorship. It appears that Reuters concedes that the regime's support base are predominantly impoverished rice farmers from the country's northeast, notorious for its lack of infrastructure including proper schools. It also concedes that the regime is busing in supporters, indicating that what little support the regime is able to show to the world, is support it itself has organized, not grassroots. Photos: Regime's supporters. Top: True believers in "democracy?" 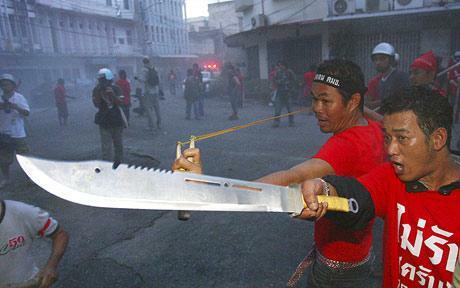 Machete wielding thugs during 2009's failed insurrection. Bottom: The establishment of politically exclusive zones called "red villages" and "red districts" where Thaksin is literally declaring political monopolies and intimidating opposition from expressing themselves. While the Thaksin denies this is their intent - there have been horrific incidents of violence throughout Thaksin's northeast epicenter of support, including the infamous hacking to death of a radio DJ's father after speaking ill of the UDD - covered in an interview with red shirt propagandist Kanyapak Maneejak (DJ Aom) of Thaksin's Chiang Mai Rak 51 faction. Kanyapak states that red shirt mobs were simply "following their hearts" when they butchered the old man outside the gates of his own home. What Reuters, TIME, and other western media organizations have attempted to do, is portray the regime's supporters as "pro-democracy" and its opponents as "anti-democracy." Are we to believe that the only people in Thailand, some 15 million who voted for the Shinawatra regime out of a population of 65 million, are the only ones capable of comprehending and appreciating real democracy? Of course not - in reality what the regime has done is targeted a foresaken region in the country, plagued by economic problems and mired in a cycle of poverty driven by a lack education and opportunities, and exploited it rather than lifting it out of these conditions. 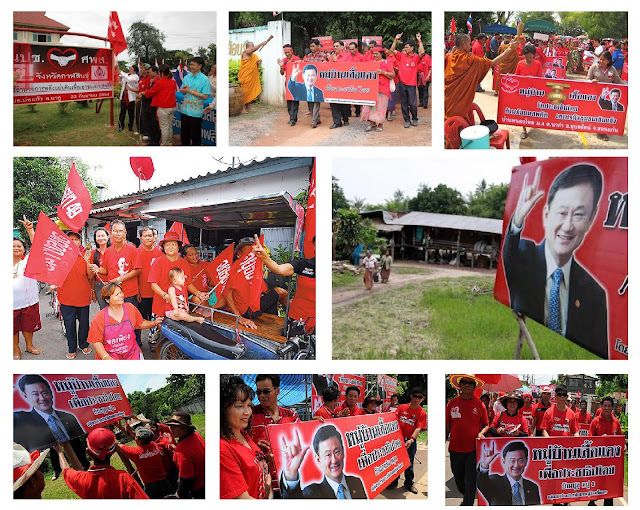 The "supporters" the regime is busing in are still pitifully impoverished, poorly educated, and clearly exhibiting dangerous signs of cultism built up around the personality of billionaire, mass murdering fugitive Thaksin Shinawatra. And like all regime-backed cults of personality, the violence of the "red shirts" is notorious. 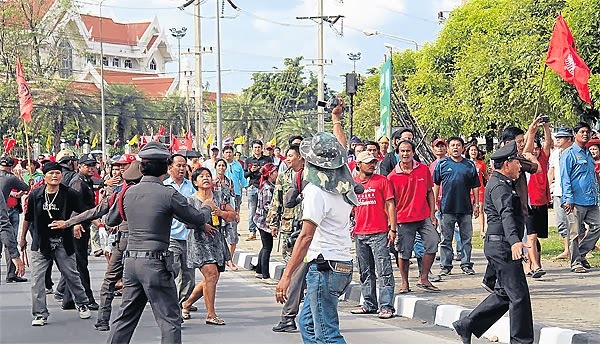 Image: Pro-regime "red shirts" assault anti-regime protesters near Pathum Thani provincial hall. Another incidentoccurred in the regime "stronghold" of Samut Prakan, where 300 pro-regime supporters attempted to attack some 3,000 anti-regime protesters. While Reuters claims the "red shirts" have thus far avoided confronting anti-regime protesters, mob leaders havealready attempted to clash with protesters at several locations. Only quick action by the police and the fact that pro-regime mobs were outnumbered by anti-regime protesters, prevented the sort of bloodshed typical with "red shirt" gatherings. In the few instances where pro-regime thugs had similar numbers, injuries were reported. Squatting on flat feet, their faces drawn with exhaustion from harvesting rice, Chantee Sanwang and Nang Laor still had the energy to tussle over who loathes Thailand's anti-government protesters more. "I really hate them," said Chantee, a rail-thin 65 year-old grandmother with teeth stained red by betel nut. Nang, also 65, refused to be outdone. "I want them dead," she countered, sending both into wheezy hysterics. "We have rejected several parties' demands for a House dissolution. The party's [Thaksin's Peua Thai Party] urgent strategy is to create fear among the public that the anti-government protests are violating the law," the source said. This open conspiracy most likely is intended to terrorize protesters into staying home on Sunday, December 1, the day of yet another mass mobilization. Previously, hundreds of thousands of protesters choked the streets of Bangkok, dwarfing pro-regime rallies by several factors even at their absolute heights. A second rally of this scale would be devastating for the embattled regime. However, now, if violence does occur in an attempt to discredit protesters, it will be blamed squarely on the regime - who, according to a former Reuters journalist, has now openly conspired to mass murder dissenters. While the West stands silent with hypocrisy and complicity, the Thai Army will have the justification needed to finally mobilize and remove the regime, just as was down in Egypt regarding Muslim Brotherhood arch-terrorist/dictator and Wall Street proxy, Mohammed Morsi.